For his pioneering contributions to statistical theory and applications, Rao received numerous awards. He has been elected to the National Academy of Sciences, USA, American Academy of Arts and Science, Fellowship of Royal Society (UK Academy of Sciences, FRS), Indian National Science Academy, Lithuanian Academy of Sciences and Third World Academy of Sciences. He was made an Honorary Member of the International Statistical Institute, International Biometric Society, Royal Statistical Society (UK), Finnish Statistical Society, Portuguese Statistical Society, Institute of Combinatorics and Applications and World Innovation Foundation. Honorary Life Fellow (limited to 11 persons at any time) of King’s College, Cambridge, UK. He has been the president of all prestigious statistical associations, the International Statistical Institute, Institute of Mathematical Statistics, USA and the International Biometric Society. He received numerous medals: Gold Medal of Calcutta University, Wilks Medal of the American Statistical Association, Wilks Army Medal, Guy Medal in Silver of the Royal Statistical Society (UK), Megnadh Saha Medal and Srinivasa Ramanujan Medal of the Indian National Science Academy, J.C. Bose Gold Medal of Bose Institute and Mahalanobis Centenary Gold Medal of the Indian Science Congress. Rao was honored by the President of USA with the prestigious National Medal of Science “as a prophet of new age” with the citation “for his contributions to the foundations of statistical theory and multivariate statistical methodology and their applications, enriching the physical, biological, mathematical, economic and engineering sciences. This honor is given every year only to five or six scientists from all disciplines. Rao received the Bhatnagar award of the Council of Scientific and Industrial Research, India. He donated the entire prize money to the Prime Minster’s Defense Fund saying that country’s need is greater than that of an individual scientist in fighting unprovoked aggression. 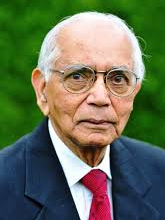 At the Berlin conference of the International Statistical Institute held in 2003, Rao received the prestigious International Mahalanobis Prize for lifetime achievement in statistics and the promotion of best statistical practice. He was inducted into the Hall of Fame of the National Institution for Quality and Reliability, Chennai Branch, for his contributions to industrial statistics and for the promotion of quality control programs in Indian industries. International conferences were held in USA, India, Canada and Switzerland and special issues of the prestigious journals like Statistical Planning and Inference, Linear Algebra and its Applications, Sankhya and several festschrift volumes were published in his honor.